NASA to Break Ground for Orion Test Pad at White Sands, N.M.
HOUSTON - NASA will break ground for a new test launch pad at the U.S. Army's White Sands Missile Range, N.M., at 8:30 a.m. CST, Wednesday, Nov. 14. The pad will be the site of a series of tests of a launch abort system that will help ensure the safety of astronauts aboard the new Orion spacecraft. NASA's Constellation Program is developing Orion to carry astronauts to the International Space Station, the moon and beyond. 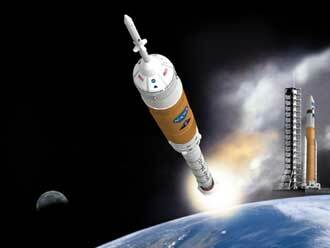 Engineers will use the test results to help design Orion's launch abort system. The first of five planned abort tests is scheduled from the new pad on Sept. 23, 2008. Two of the tests will evaluate the performance of the launch abort system at ground level. Three more tests will evaluate its performance at different altitudes. News media are invited to attend the groundbreaking event and tour the construction site. Media who want to attend should contact the White Sands Missile Range Public Affairs Office at 575-678-1134 by noon Tuesday, Nov. 13, to request credentials. Media should arrive no later 8 a.m. at the range's gate, where they will be met by a public affairs representative.